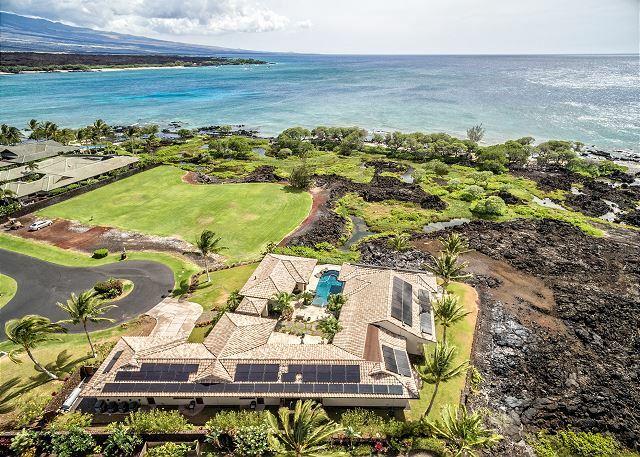 This private beachfront estate offers all one could desire in a vacation home. 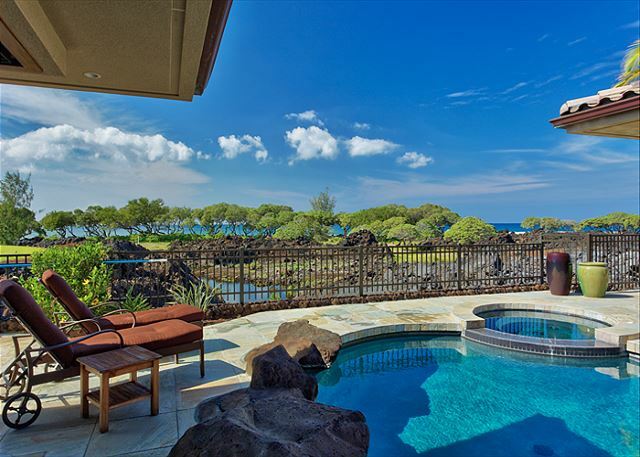 Enjoy one of the largest houses at Kolea offering 5 bedrooms and 5.5 bathrooms with endless ocean views. 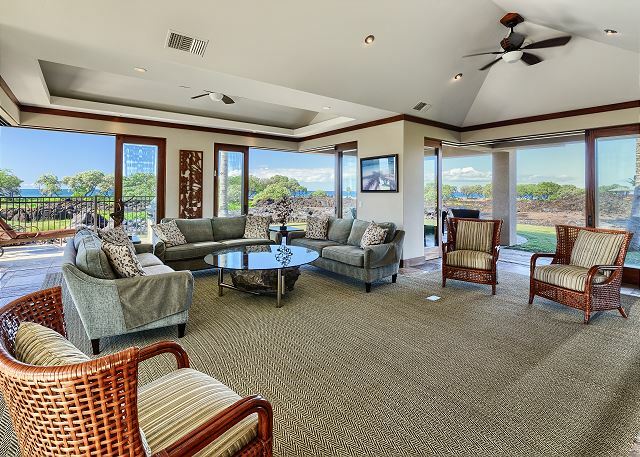 Enjoy Kolea luxury at its finest at this private beachfront estate. 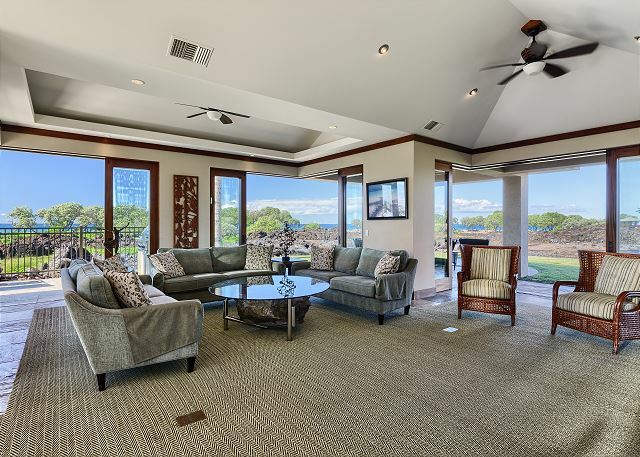 This 5 bedroom/5.5 bath home offers an expansive ocean view including views of the mountains and beach. Enjoy watching the whales frolic in the blue waters of the Pacific during the winter months. 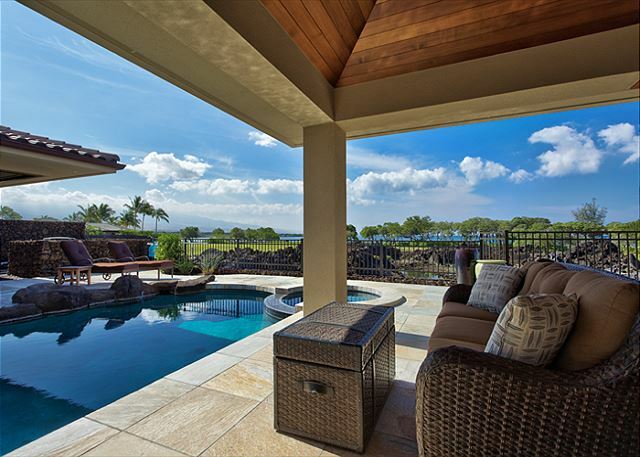 Along with an expansive view, this spacious home offers a very private location at Kolea. 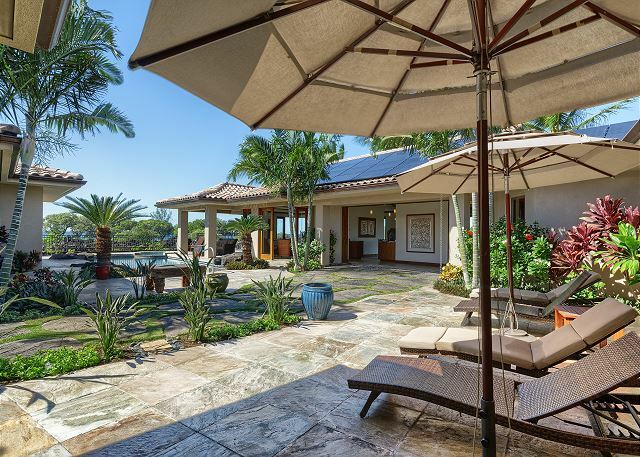 Just on the other side of the gates of this estate is a nicely manicured courtyard area with a heated pool and Jacuzzi with an open view of the ocean and ponds. 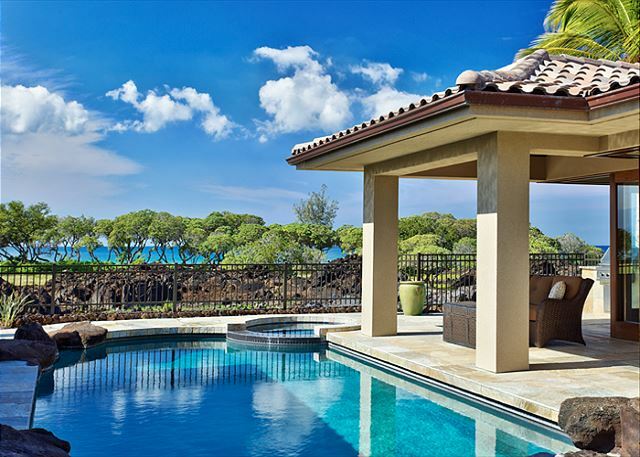 Along with the pool is a lounging area with a couch and chairs for sunbathing along with an umbrella for those who prefer shade. Also in the courtyard is a full size stainless steel grill. 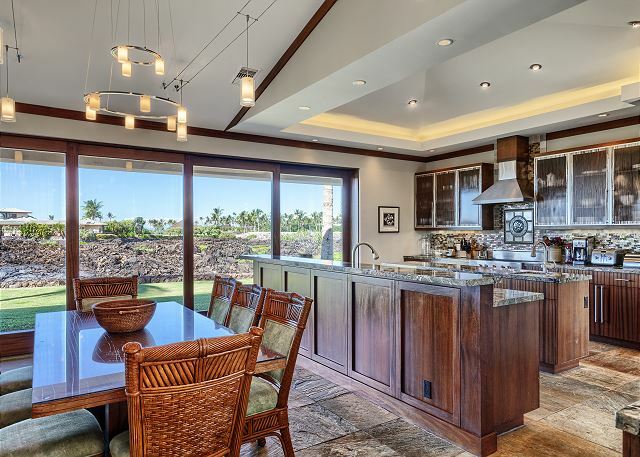 As you enter the home through the large pocket doors you will find the kitchen and dining area. The kitchen is built for the ultimate culinary experience. 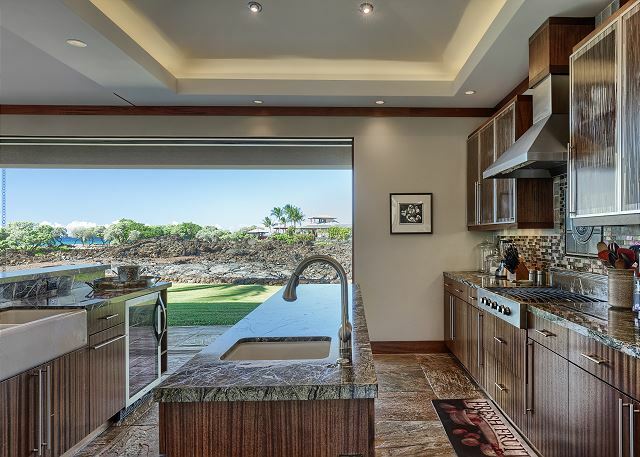 Throughout the kitchen are stainless steel appliances and granite counters. The gas stove is any chef’s dream. 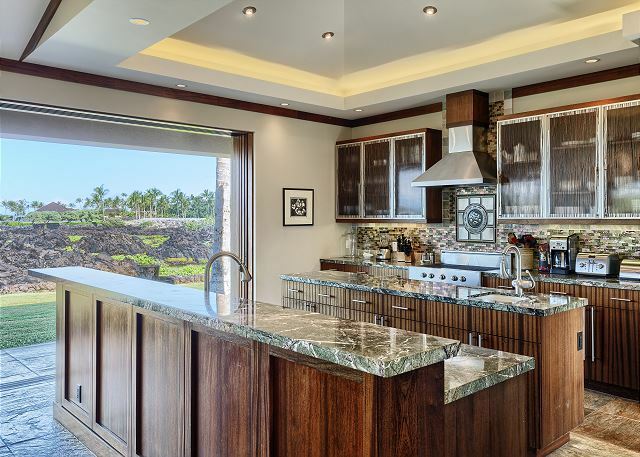 The granite island offers ample space for preparing meals. Off the kitchen is the dining area, which seats eight. Enjoy the view from both of these locations! Just steps from the dining area is the main living area. Here you will find three sofas facing a big screen LCD television with a DVD player and extended cable. If you are not watching television, enjoy the view as you read your favorite book. There are also four chairs for relaxing. 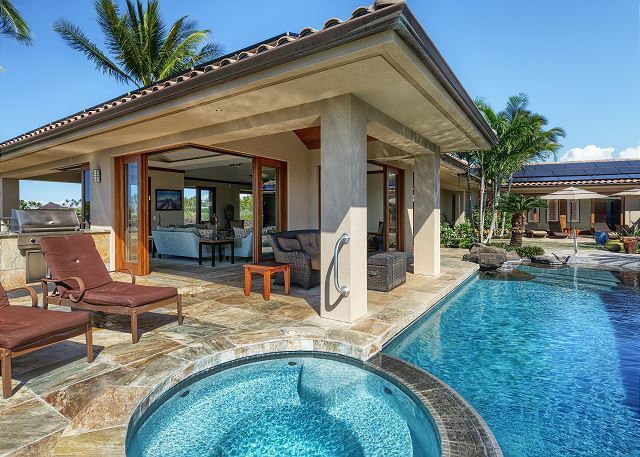 The main lanai as well as the courtyard area is accessible from the living area. 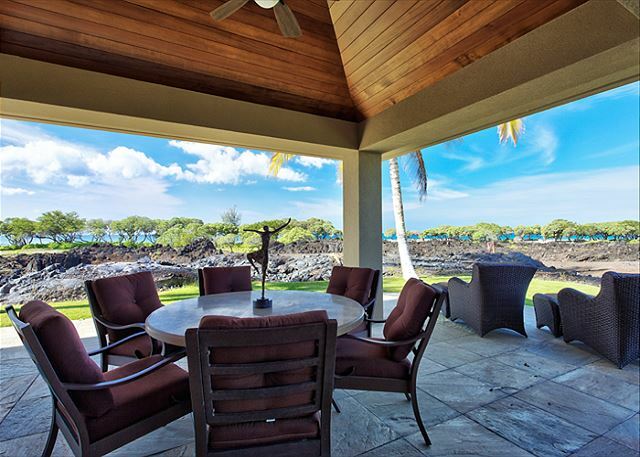 Enjoy a large table with chairs in a shaded setting on the main lanai and take in the expansive ocean view and the sounds of the ocean and palms. Also located in the main house are three bedrooms. 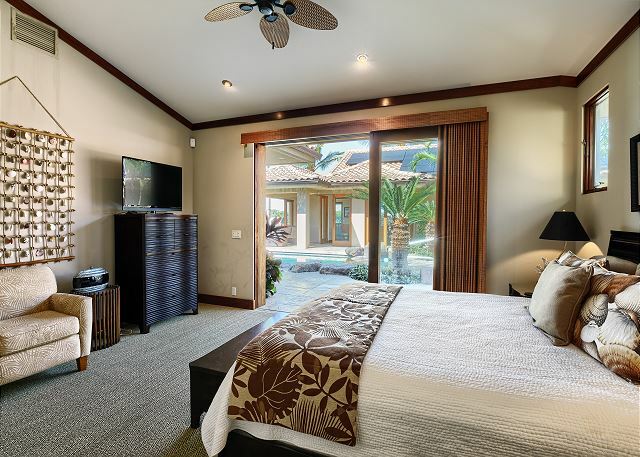 The master suite has a king size bed with bedside tables and a LCD television. 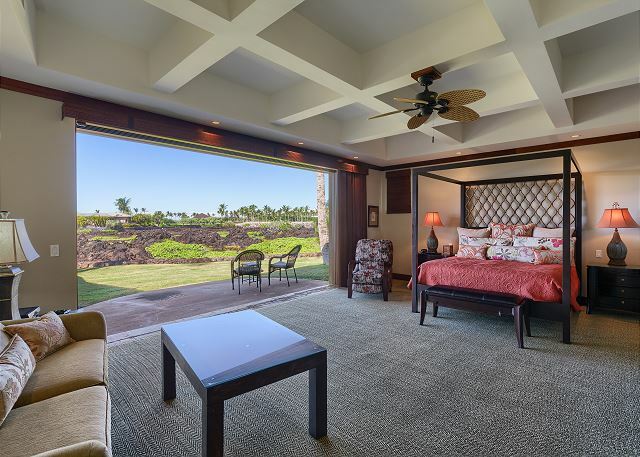 The view is visible from the bed just over the private lanai. There is a couch adjacent to the bed for lounging. 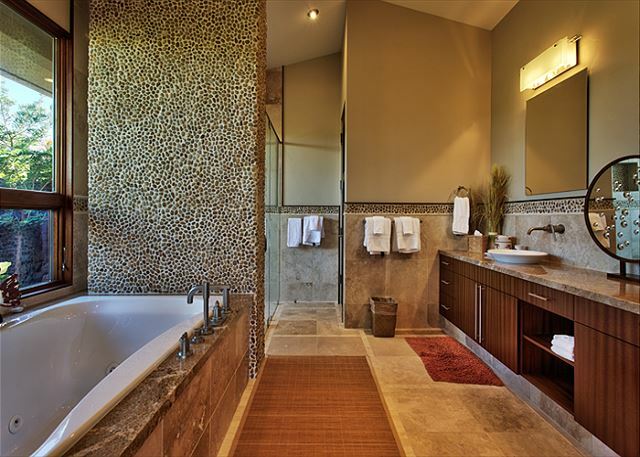 The attached master bath offers ample space with vaulted ceilings. Along with the dual vanities, there is a deep soaking Jacuzzi tub. 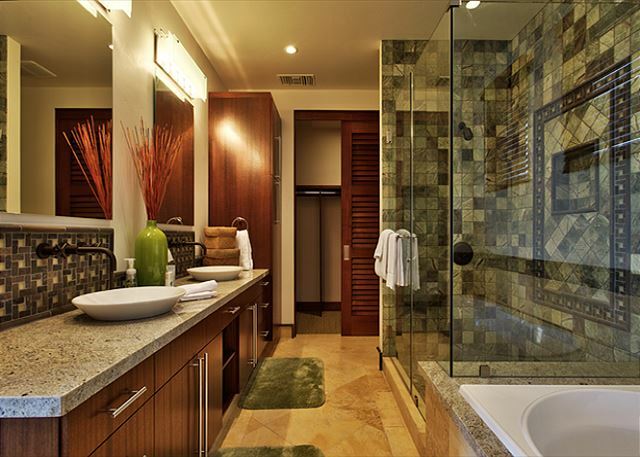 The shower has dual shower heads and opens up to an outdoor shower with tropical foliage. 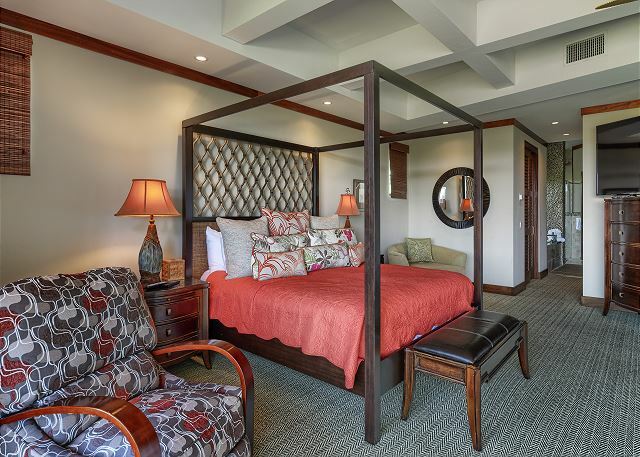 Just down the hall from the master suite are two guest bedrooms. 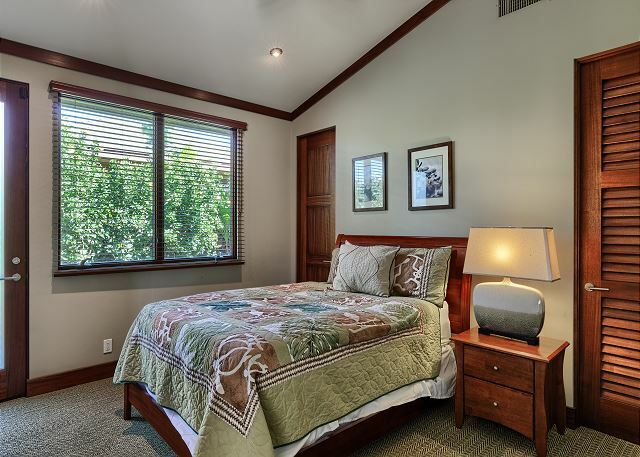 The first bedroom has a queen size bed with a LCD television. The attached bath has a tub/shower combo. 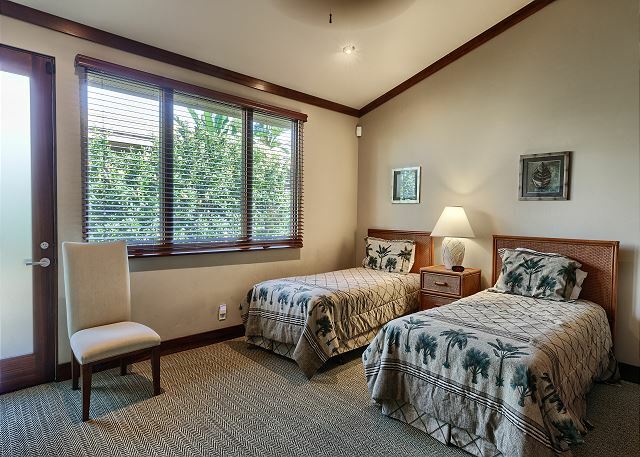 The second guest bedroom has two twin beds with a LCD television. The attached bath has a walk in shower. Also located in the main house is the entertainment room. Along with a large wrap around couch there is a big screen LCD television with extended cable and a DVD player. On the other side of the courtyard area are the two guest hales. 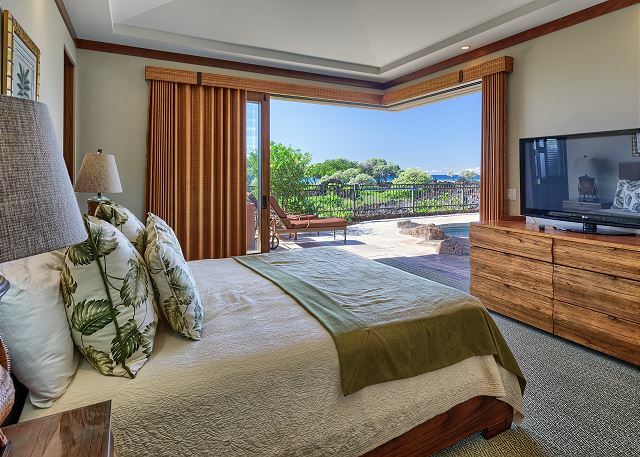 The first guest hale has a king size bed with a LCD television and has the best ocean view of any bedroom in the house. The attached bath has dual vanities with a Jacuzzi tub and a walk in shower. The second guest hale has a king size bed. The attached bath has a tub/shower combo. Other amenities include five zone air conditioning for ultimate comfort, and a laundry room including a full size washer and dryer. 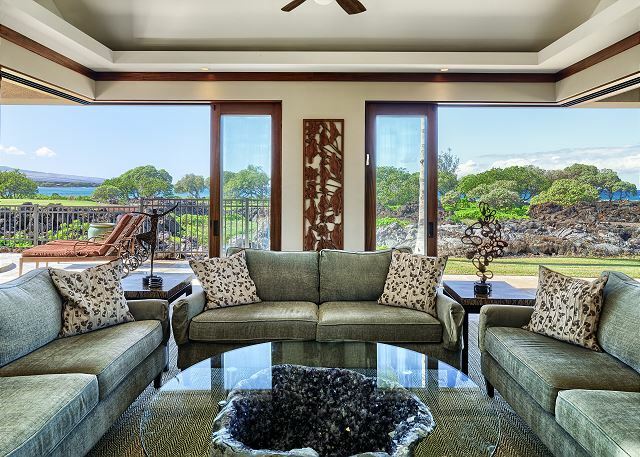 Guests of this home get access to a private concierge. The concierge will greet you upon arrival and make sure every aspect of your stay is perfect! 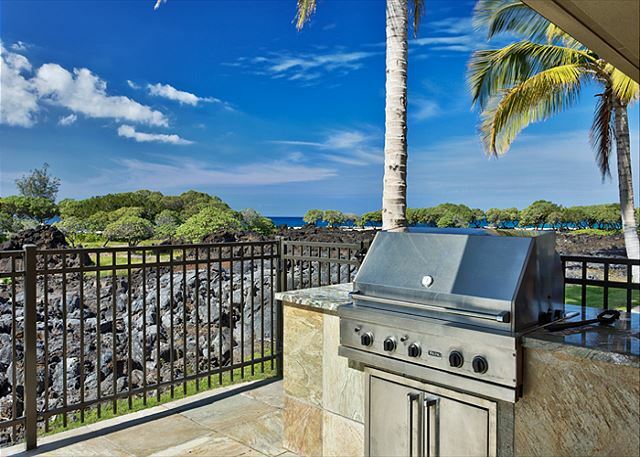 Pre arrival grocery shopping as well as a lei greeting are just a few of the many services available to you at this private estate at Kolea. An extended family group of 8 adults spent a week at this wonderful house, the second time we have stayed at Kolea 13. 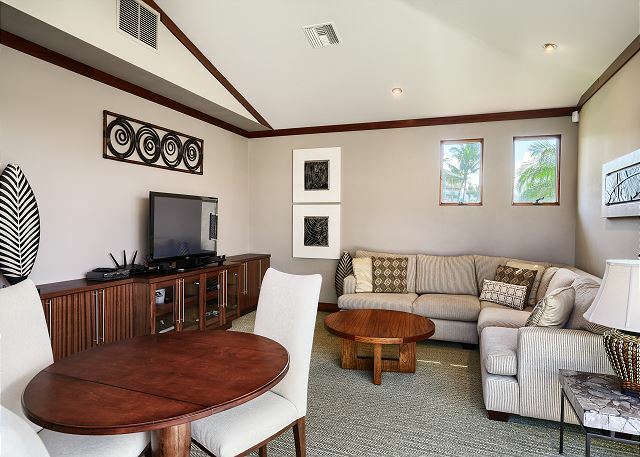 It is a simply amazing house for a large group, private, quiet, many secluded spots and other gathering spots, and a short walking distance from beach, shopping, the great Hilton pools, golf, etc. The kitchen is amazing and very well stocked. If you love to cook as much as we do, you will enjoy it and there is a Costco not far from the airport to stock up. The only downside is the single, small dishwasher, which made cleaning up a daily challenge. 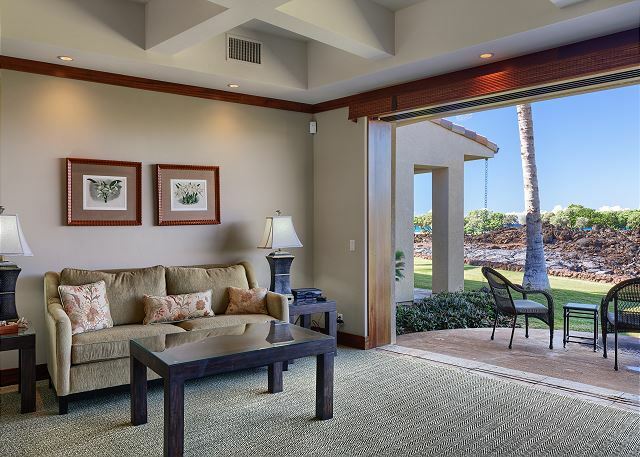 Most of the walls open up to the outside, so you can enjoy the great Hawaiian air all day long. The pool and hot tub were used many times a day. The only problem with this house is the construction of a new house on the lot next door. Luckily while we were there they were only building a rock wall with very little noise, but presumably that will soon change. The management group is great, very helpful and professional. We strongly recommend the Merriman's restaurant in nearby Waimea. One of the best meals we have had in the Hawaiian islands, definitely worth the drive.